Earlier this year I reviewed the M2 35" standing desk at GeekDad. 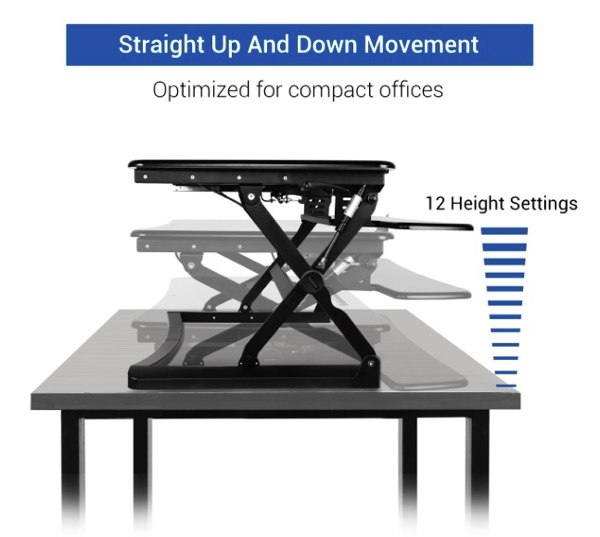 Well, FlexiSpot just released a new desk to thier line of standing desks, the FlexiSpot F3. I've run the gamut on standing desks. I started by playing MacGyver and creating my own, then my employer purchased me an Ergotron and now with FlexiSpot I found a nice sweet spot..a quality product that is also budget friendly. FlexiSpot ran across my blog post about the make-shift "MacGyverized" standing desk I put together at work (before I got the Ergotron) and asked if I would be interested in reviewing one of their standing desks. Honestly, I had never heard of FlexiSpot before and I had to look them up. I liked their design so I said yes, and they sent me one of their 35" Desktop Workstations (the FlexiSpot M2-35"). FlexiSpot is a subsidiary of Loctek, which has been producing TV mounts and computer monitor stands and desks since 1998. I didn't know a lot about Loctek either, but I did get a chance to stop by the Loctek booth at CES and I was impressed. My first test of the FlexiSpot M2 was to assemble it at home. First off, this standing desk is a serious piece of furniture. In other words, don't drop it on your toes while unboxing it (I didn't, but given its heft the thought did cross my mind). The FlexiSpot M2 comes almost completely assembled. Once you take it out of the box and set it on your existing desk surface, the only real assembly required is to attach the keyboard platform which only takes a few minutes. There are quite a few varieties of standing desks out there. Some are complete desks and others are meant to be integrated with a desk you already own. The FlexiSpot M2 is the latter, so I placed it on top of my existing desk at home (which is an oak desk that my wife and I designed and built ourselves). The first thing I noticed about the desk once I got it assembled (but before I got my computer monitor on it) was that the articulating mechanism (they use a gas spring hovering system) seemed over-powered as it moved a little too quickly for my taste. But I judged too quickly. The mechanism was designed for the desk to actually have something on its surface and I was testing it with nothing on top. Once I got my monitor and a few odds and ends set on the surface, the mechanism produced a very smooth and controlled movement of the desk surface. One of the most important features of a standing desk is how easily it can be adjusted from being used seated to being used while standing. The FlexiSpot's spring hover system is not only easy to operate thanks to the dual latches under the desk surface on each side of the desk but it also locks into position and stays there until you want to move it. You will have no issues changing the desk height back and forth all day long without even having to think about it. The next thing I noticed about the desk was its capacity. I have a 27" monitor at home and even with that large monitor on the desk I still had a ton of room to spare. The keyboard surface was also quite roomy. This is important for me because I always have other things with me when I am working at my desk (coffee, my iPhone, headphones...) and this desk gave me plenty of room in which to set all of these things. My last major observation about the FlexiSpot M2 was how rock solid the desk was. Like I mentioned before, I have an Ergotron at work (a WorkFit-S, Dual Monitor with Worksurface+) and while it is a very nice standing desk it has a few drawbacks. The main difference between the FlexiSpot and the Ergotron is that the FlexiSpot is a much sturdier desk. I stand for a majority of my work day at work and because of that I tend to shift my standing position around quite a bit. Sometimes I find myself leaning against the desk a bit (leaning on one or two hands on the keyboard surface to support myself while reading for example) and what I noticed right away was the FlexiSpot was like leaning against a solid wall. At no point was I worried about leaning too much on the desk or worried that the gas spring hovering system wasn't going to hold. I can't do that with my Ergotron at work, not without accidentally moving the desk surface to a lower position. The FlexiSpot gave me an extremely stable surface, and once it was locked into a certain position it wasn't going anywhere. After using the standing desk at home for a weekend I sent the desk into work with my wife. My wife's employer provided her with a standing desk, but that desk took up too much space and didn't leave her enough room to be able to spread out engineering drawings on either side of the standing desk. So she has been without a standing desk at work for a while now. So she gave the FlexiSpot a try. Unfortunately, she has a very strange desk setup at work. She has a curved center section with 2 straight sections on either side and above her desk she has two storage cabinets. Because of this strange geometry she needed a standing desk that would fit in between her two above desk storage cabinets and the 35" version of the FlexiSpot was just too wide. However, she was able to try out the desk at home and she really enjoyed the layout and the raising/lowering mechanism. The smaller 27" version (the FlexiSpot M1) has a small enough footprint it would have worked just fine for her at work with her desk configuration. FlexiSpot also has a 41" corner desk (the M4) and an even larger 47" desk (the M3) and both are new products but available for pre-order. So that brings up a good point...make sure you take good measurements of your desk before you decide on a size. In my case, I chose the 35" because it was comparable to my desk at work I knew it would work for us at home. FlexiSpot has photos with dimensions of each desk, so take a few minutes and make sure those dimensions will work well with the desk you plan to use with your FlexiSpot. Also, don't forget about measuring for height above the floor. Remember, the FlexiSpot sits on an existing desk surface. So once you add a monitor to the FlexiSpot your monitor will now be sitting between 8" and 19" higher now (depending on which of the 12 height settings you dynamically choose). The thing to watch out for is the new minimum height your monitor will now be sitting at with the FlexiSpot at its lowest position. Make sure that height still works for everyone in your family given the existing height of your desk surface, the additional 8" of height for the FlexiSpot in its lowest position and the seating position you are in with your current desk chair. In summary I was really impressed with the FlexiSpot M2. It was easy to assemble, had a very smooth raising/lowering mechanical action and was extremely sturdy. It even has a groove built into it so you could prop up your phone or tablet and have it just below your line of sight with your computer monitor (a really nice touch). If you have been thinking about getting a standing desk but have been deterred by price, the FlexiSpot is worth considering. It is less expensive than many other standing desks out there but is still a very high quality standing desk.